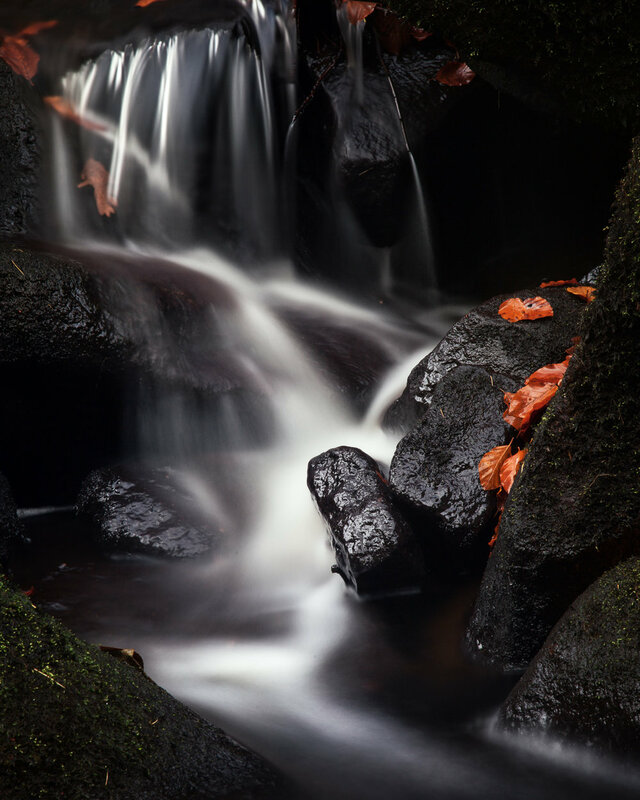 I've been hitting Padley Gorge quite hard this autumn, keen to explore its abundant beauty and interest. I've now been each of the last 4 weeks and it's been interesting to watch it change over that time, with each trip different to the last. Although some colour remains, Autumn is certainly past it's best with a lot of leaves on the ground. I actually quite like it at the moment. The remaining colours are browner, more muted and there's a less diverse colour palette to work with that helps give images more focus and simplicity. As the colours wane I'm sure it will also become much quieter allowing me to explore its greater depths in solitude. This week I again travelled down from the top of the gorge. I stayed awhile with the trees, trying to unpick their character. As beautiful and interesting as they are, successful photographs of their personality continue to elude me. I mused recently that it seems some photographers "get" trees and are very confident and successful in capturing their spirit. They see something in trees and have an ability to depict them that I really admire and long for - Dav Thomas (@peaklandscapes) and Iain Sarjeant (@iainsarjeant) are two that spring to mind. Nonetheless I shall spend more time with the trees as they are interesting beings, and maybe they'll share some of their secrets with me as we get to know each other a bit more in the future. However I did have the brook to play in. So I dropped down to spend an hour or so shooting the cascades, which I could lose myself forever in. Whilst I may not be a "tree person" I do think of myself as a "waterfall person". Though I wonder if waterfalls have become an overshot cliche I find them utterly fascinating and so care not a jot. Each of them has their own unique personality and the way that the water has relentlessly coursed a path through this rocky landscape over the millennia is quite something to get your head around. I love looking for particularly captivating flows and patterns, interesting rocks supporting or blocking the flow and how the personality of the waterfall changes with the weather. My aim as a waterfall person isn't just to get nice waterfall shots but rather to find details, things of interest within the falls to share with others. And so I hope that this love for the waterfall shines through and makes my images more than a cliche. I came across an interesting fall and spent a good while (indeed, maybe an hour) shooting it with a variety of shutter speeds and experimenting with some really long exposures (upwards of 4 minutes). It turns out the results of those really long exposures didn't bring out very much different personality in the fall than a 30 second exposure, so there's a lesson learned there that should save me time in the future. During a 6 minute exposure I did a bit of looking about for alternate compositions (6 minutes, plus another 6 minutes for long exposure noise reduction is a long time to sit around on a chilly day!). It turns out that this fall was part of the same set of falls from last week's "Making the Image" post. I knew it was close to this spot but I didn't realise just how close as it looks completely different this week! 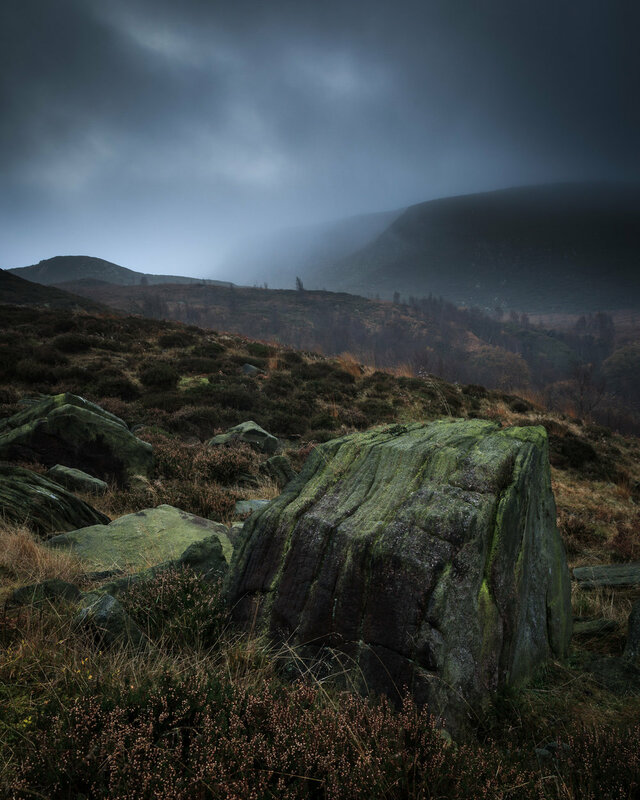 Similarly there's another shot that I made on my first visit to Padley that I really like. I recall exactly where the spot is and I often look down on it to see if there's anything interesting going on. I haven't seen it with the same water level and swirly patterns as on that first trip. This just goes to show how the personality of a waterfall changes, and that the image you make one week probably won't be there the next. This makes for a world of endless possibilities, and perhaps one or two frustrations where you want to re-shoot a shot that didn't quite work. I think this also highlights the importance of improving your ability to find shots. With conditions always changing, and not always for the better, we can't expect to turn up and recreate an image we've seen. It's enough to know there are possibilities in the area so just go and find something that draws you to it. This means becoming a bit of an explorer, looking out for patterns and details, interesting compositions, something that moves you, something that shows part of your personality as much as the waterfall's. It might sound arty farty but originality in our own work is driven internally, by the things that interest and attract us. In some ways photography is a an exploration of oneself as much as the landscape. And so it's interesting that while I've spent time among the trees watching their autumn cloak bloom and shed it is the changes in the waterfalls I have noticed and appreciated the most. I really must be a "waterfall person". With that said, let me leave you with the image that I spent that hour playing with.